It's far too early to be thinking about production for FlickFleet, so I've spent a good chunk of this week thinking about production considerations for FlickFleet *shakes head*. I'd like the game to retail (i.e. the price on my website) to be about £30 ideally. My first quote for the laser cutting was going to be £60 per game (regardless of print run size), then there would be the box, rules, ship cards and wooden pieces on top of that. I'd end up losing a ton of money unless I priced it around £100! Which is clearly a crazy price. Since then I've been looking around for other options, and I found another company that would do it for £20 (so probably £40-£50 retail once the other stuff is included) and then last week I bumped into the MakerSpace people who reckoned (wild guess at this point) about £3 per game plus £10 per month, so assuming 16 games a month around £3.50 a game. That price doesn't include perspex (which is about £7.50), so the two of them are about £11. 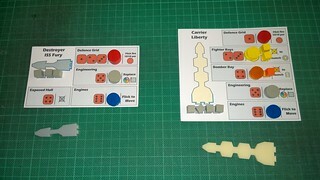 Then there's the box card and labels, rulebook, ship cards and wooden bits. My guess is it'll end up being in the £30-£40 range with this option. Obviously I need to price up the boxes, rulebooks, ship cards and wooden bits at volume. I also need to check the pricing on the laser cutting at MakerSpace, but it's not looking obscenely expensive like it was to begin with. It turns out the perspex is the really expensive part, so I've laid out 4 games worth of perspex pieces on a bigger piece of perspex and done it more efficiently - I've got from 500x400mm down to 470x395mm (which over a lot of games actually saves quite a lot!). I had to lose a destroyer from each player's allotment, but 3 destroyers, 2 carriers and a dreadnought (plus all their fighters and bombers) is plenty for a decent sized game and several different scenarios. Before I can think seriously about production I need to do a bunch of things: playtest the crap out of it (in progress, I'm hoping to playtest it with Belgians this week during my trip to Brussels! ), confirm ship points values, come up with some scenarios, write up the rules properly in InDesign with examples, images, etc. and design a box. Finally, here's an update on the PIP situation, no movement again this week, the competition for the free, unique early prototype closes on Thursday, so if you'd like to get your hands on the free prototype time is running out! And by too good I don't mean great, I mean good, just too much. Traditionally when I design a game the first play is curtailed about a third of the way through. We agree never to talk about it again and I go away and work on the hideously broken mess that was the physical incarnation of a game that was great in my head. Later, once I've fixed the most glaring errors, we reconvene and as we play it's still broken, but not so broken. Maybe we change a couple of rules as we go, evolving things that don't work in practice. This can go on for months. Eventually, we reach a point where the game is reasonably stable and it's only the occasional edge case where something unusual happens that requires a change to the rules. But by this point the game has been through several iterations, and lots of ideas have been tried out. Some have worked, others not so much. But there's a possibility space around the current rules where I've got a good understanding about what changing various things about the game does to the feel of the game. And I've lots of ideas about what I can change to improve it. FlickFleet is an anomaly in that regard. I first played it (once!) in July with MDF toy food. It was fun and definitely worth pursuing. 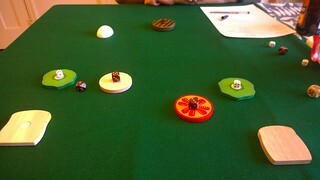 After a few months I finally got some bits laser cut and played it again four times at Newcastle Playtest in October. It was definitely still fun. We made a couple of changes after the first game and then left it alone. I'd not yet ordered the wooden pieces or made the ship cards, so the bookkeeping was all done with pencil and paper, which was sub-optimal, but hey, early prototype, so who cares. Just in time for NaGa DeMon in November I did the ship cards and the wooden pieces arrived. I've also played it a lot in November. And it works, which is surprising. 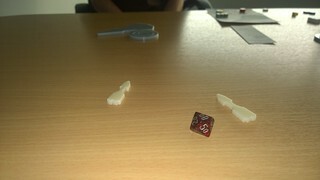 It's been getting great feedback ("I prefer it to X-Wing", "It's as good as Flick 'Em Up") and it's good fun. But it's not yet great. And with nothing obviously broken I'm struggling to see what I should be changing to see if I can get it from good to great. Last week I played a couple of games of FlickFleet (bring the Dreadnought into play for the first time in the office lunch break sessions), which let me tweak the Destroyer's point value slightly - I think I under cooked it - it's more like 12 than 9 points (though it is especially vulnerable to fighters and bombers). I've also been thinking about how I could get it made and whether it's possible to get the laser cutting done professionally at an affordable price. I've found a company who will do it for £20 a copy including perspex and VAT, which is much better than my first quote, but still very expensive. Then quite by fluke I bumped into the guys from the Newcastle Maker Space at a craft fair on the weekend. I spent some time talking to one of them about the project and he reckons it would be about £3 a copy (plus £10 a month membership). So if I could make 4 a week that would be less than £3.50 a game (plus perspex). This is looking much more affordable (if far more draining on my time as I would have to be there to run the machine). Now that the points values are starting to take shape I can start considering some scenarios for the game. 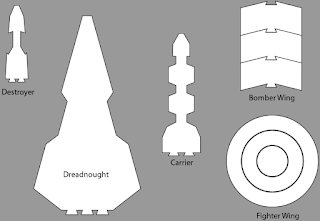 I know that two destroyers are more or less equal to a fully-laden carrier and three are equivalent to a fully-laden dreadnought, so there are a couple of fair-ish fights that I need to come up with a story for. But in scenarios there are other things you can do than just a points-based fair fight (which is the point of free play). I can play with things like reinforcements arriving halfway through a game or goals other than destroy your opponents (cross the board and exit before being destroyed, protect a departing civilian ship, stay alive until reinforcements arrive, etc.). I think having a turn counter would help with a few of these. What scenario ideas do you have? Tonight I'm having the first playtesting night at my house since I started Eurydice Games (I've been meaning to do this for months but work travel has kept getting in the way). Hopefully we can try out a few of these ideas and then I can write some of them up into the rules that I published a while ago. Finally, here's an update on the PIP situation, no movement at all this week, there's only two weeks left now, so if you'd like to get your hands on the free prototype time is running out! 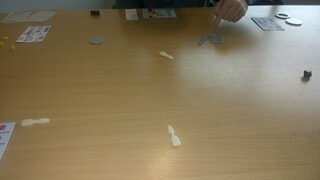 I got a couple more games of FlickFleet in at lunchtime today and I've another planned for Friday lunchtime too. I'm using these games to continue to work on the point values for the ships (I think Destroyers need to go up a bit) and also to see if there's anything I can do to simplify things without losing the essence of the game. Still no changes to the rules or ships at this point. 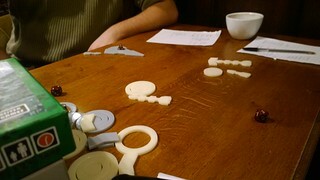 In other news, I've started to think at a very early stage about the manufacturing of the game. The biggest stumbling block is going to be the cost of laser-cutting the pieces, seeing as the cost is largely proportional to the laser burning time, so more copies is more expensive - there's little in the way of economies of scale. 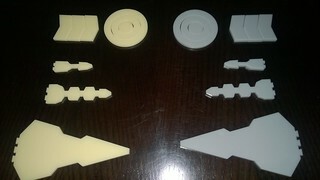 I've done a very simple first stab at the ship shapes - just something to get me started. Since making my copy in September I've changed the way the ships move (you now flick them too) so my original plan for the bomber wings (three stacked chevrons) no longer works - when you flick them they separate. To combat this, the next version will jigsaw together so moving them doesn't cause them to separate. The ship shapes are an interesting conundrum. I want them to be big enough to not get knocked around too much by the dice and yet small enough that they don't use up too much perspex. I want them to look visually like spaceships, but to minimise the length of their outlines to reduce total burn time. On top of that there's some constraints of the manufacturing process, if they are made out of 5mm thick perspex, they shouldn't have bits less than 5mm thick to minimise warping from the laser heat. The most surprising thing about NaGa DeMon 2017 is that I've not made any changes to FlickFleet yet. It's been through four playtests last week and I've not come out of them with any changes to make to the gameplay. That won't continue, it's almost certainly too complex and will need some simplifying, but there's nothing glaringly broken about it, which is great at this very early stage in the game's development. The most interesting thing I found was the bombers. Due to firing a D6, they always damage capital ships on a hit and do double damage. So against capital ships they are way better than fighters. The downside of them is that against fighters (which fire first) they are actually pretty weak - the fighters can destroy them before they get a chance to attack, or at least severely hamper them. Finally, here's an update on the PIP situation, we've got a couple more people involved during the week, but Officer Cadet Not A Cyborg Zircher and Very Petty Officer Book are still ahead! FlickFleet has been a long time coming. My friend Paul and I had the idea on a walk last summer, but I didn't do anything with it at the time. It wasn't until this summer that I had the idea of using the dice as projectiles and the die results and a damage selector, at which point I got really excited about it again. I tried it out this summer with my brother-in-law and then Paul again using MDF toy food and it kinda worked, so I was inspired to do a design for the ship pieces and get them cut out (which I did with the help of my friend Dan) in September. The first attempt using MDF food! 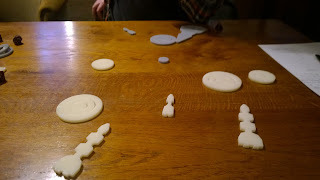 Once I had the laser cut pieces I was able to take a half-made prototype to Newcastle Playtest at the beginning of October (it was just the ships, I used frantic scribbling on pen and paper to record the status of the ships). We played this four times that evening (two against me, two with me watching) and most of the people who played wanted to play again. It was described as 'fun' which, considering it was it's first real outing and it was half-finished, was very exciting. I got the wooden pieces I needed ordered from SpielMaterial a couple of weeks ago and then the ship cards design done and printed last week. Now all I needed to do was play the latest version and start iterating versions to iron out the inevitable kinks. With these successes under my belt I was keen to make more progress, but I've been focussing on hand-crafting the Zombology print-run so that I've got some stock for sale, so I've not really made any FlickFleet progress. I've decided to do NaGa DeMon again just to give me the kick up the behind I need to crack on with this. I'm hoping that it will force me to make some progress, but also in an ideal world rope in some crowd-sourced wisdom to make the game improve even faster. And so far, so good. I've had some great feedback on the rules and I've managed to play the game a couple of times at work in my lunch breaks where it earnt the 'I prefer this to X-Wing' plaudit from Chris! I'm focussing at the moment on fixing any glaring problems (I haven't found any yet which is both bizarre and exciting!) and trying to sort out the point values of the various ships (which I need for free play and to design balanced asymmetric scenarios). I've even taken the prototype with me to Paris (for a 24 hour work trip!) so that I can spend my evening in a hotel facing various combinations of ships off against each other to get a feel for what the point value of each type should be. I really hope that someone who gets involved with my NaGa DeMon challenge does have access to a laser cutter and I can start getting feedback from a wider variety of people. I think this game has huge potential, now I just need to test the crap out of it and more playtesters means faster feedback! NaGa DeMon 2017 Part 2 - Let's Make It! As I mentioned last time, to make FlickFleet (in it's current incarnation) you need a bunch of laser cut ships, some wooden discs and cubes, the rules and some ship cards. The ship cards are two sheets of A3 that need cutting into seven parts (the cut marks should be self-explanatory. One page is the ship cards for the Imperium, the other for the Insurrection, other than colour differences they are the same. You can download them here. You also need a D10 and a D6 (with fairly rounded corners). The laser cut file is for a piece of material that is 25x20cm. I use 5mm thick perspex but, as long as it's not too thin, MDF or wood would probably work fine. You need to cut a couple of sheets so you've got pieces for both sides, but to be honest you could just cut it once and play asymmetric scenarios using one set of ships (which obviously means you need half as many cubes and discs and only one sheet of A3 ship cards). I've done it as an SVG file, but if you need it in a different format I can probably convert it - just let me know the specs. So you are the perfect person, you have a laser cutter, some perspex lying around, an A3 printer and bot loads of wooden discs and cubes. You've got nothing better to do than make a prototype for me (those PIPs are like crack aren't they? ), so what is it I want you to test? Number one: Is it fun? Does it have potential? Did you enjoy playing? What changes would you recommend? My intent is that the game can be played in free play where players can build a fleet of their choosing up to a given points total or scenarios, where the players have potentially differing fleets, differing points and differing goals. I currently have no points values for the ships and no scenarios. So any ideas on those fronts would be much appreciated. I've decided on the walk to the station this morning to take part in NaGa DeMon (National Game Design Month) again this November. Like the good old days I'll be running a competition so you can all collect Pointless Internet Points (PIPs) for all the help you provide me during the month. The person who helps the most will get a copy of the game as it stands at the end of November shipped anywhere in the world for free! In addition, the top three (at least) will get their names mentioned in the rulebook in the examples and everyone who gets involved will get a shoutout in the credits. This time round I'm working on a dexterity game (I've alluded to it a few times on twitter as the 'Super Secret Dexterity Game' - clearly it's less secret now!). It's essentially the illegitimate lovechild of Star Wars Armada and Pitch Car - a game in which you flick a fleet of capital ships around a table and then flick dice at each other to fire weapons. You can read the latest rules (and comment to your heart's content) here. All points are awarded at my discretion and I'm capricious, so have a go and see what happens!